Joe Mynhardt is a South African horror writer, publisher, editor and teacher with over fifty short story publications. He has appeared in dozens of publications and collections, among them FOR THE NIGHT IS DARK (with Jasper Bark, Tonia Brown and Scott Nicholson). Joe is also the owner and operator of Crystal Lake Publishing. He has published and edited PAUL KANE’S SLEEPER(S), DANIEL I. RUSSELL’S TRICKS, MISCHIEF AND MAYHEM and FEAR THE REAPER. Upcoming collections Joe has edited include KEVIN LUCIA’S THINGS SLIP THROUGH, WILLIAM MEIKLE’S SAMURAI AND OTHER STORIES, GARY MCMAHON’S WHERE YOU LIVE, THE OUTSIDERS (Simon Bestwick, Gary McMahon etc. ), CHILDREN OF THE GRAVE (Joe McKinney, Armand Rosamilia etc.) and TALES FROM THE LAKE VOL.1 (Graham Masterton, Tim Curran etc.). His collection of short stories, LOST IN THE DARK, is available through Amazon. 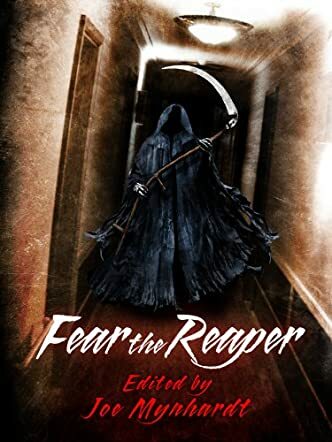 Fear the Reaper by Joe Mynhardt is a delicious blend of short stories with one common thread running through them: they all include a close encounter with the old man himself, the Grim Reaper. Each author in this set was asked to produce a new, unique story involving such an encounter, and all of them came through admirably. Twenty-two new tales of distinctly different speculations regarding what may await you as you cross over from this life to…? It is commonly said there are only two things in this world that are certain: death and taxes. But even those are decidedly different. I wouldn’t advise it, but you can cheat on your taxes; you can never cheat death. Some of the key players in this stellar tribute to the late Rick Hautala have attempted to prove me wrong, but death always wins in the end. Many great minds went into the production of this anthology. Some you have no doubt previously read, and already admire. Others may be unfamiliar to you, but once you’ve read these stories, you may be adding some new names of your list of favorite authors. A few of these authors have used a touch of humor to soften that ultimate blow. Others pull out all the stops, and do their best to scare you half to death… naturally. Mynhardt, as editor of this collection, has done a great service to these authors, as well as their readers. There are stories in Fear the Reaper that you will be repeating to your grandchildren around the campfire some warm summer’s eve. There are others you will go to great pains to forget. Fear the Reaper in its entirety is a sterling example of what can result when a superb editor invites some excellent, if unknown, authors to participate in a great tribute to a great man.